About 0230 on Sunday, 21 July, units of McDowell's army began leaving their camps at Centreville. From the start the march was beset with delays. Tyler's division moved onto the Warrenton Turnpike first, which delayed the movement of the flanking columns of Hunter and Heintzelman. Tyler, stung by his rebuke from McDowell two days earlier, took his time and moved cautiously westward. Traveling with Tyler’s division was a 2 1/2-ton, 30-pounder Parrott rifle. When it arrived at the Cub Run Bridge, there was concern the structure might not hold the gun’s weight. The column halted while engineers reinforced the bridge, causing further delay. It was not until 0530 that the rear of Tyler’s column finally crossed Cub Run Bridge, allowing Hunter and Heintzelman to cross and begin their march north toward Sudley and Poplar fords. The two commanders discovered, however, that the route chosen by the engineers soon turned into a little-used footpath through the woods. With frequent halts to clear trees and brush, the column slowly worked its way northward. At 0600 the head of Tyler’s column reached the vicinity of the Stone Bridge. Sherman's brigade deployed to the north side of the pike, while Schenck's brigade moved to the south side. Keyes' brigade remained on the turnpike, some distance in the rear in reserve. Tyler began his demonstration by having the 30-pounder Parrott rifle, joined by his other artillery, open fire across Bull Run. On the west side of Bull Run, near the Stone Bridge, waited the 1,100- man brigade of 37-year-old Colonel Evans. Evans, a West Point graduate, was known as a tough, profane fighter and a hard drinker. Evans’ command consisted of the 4th South Carolina Infantry and the 1st Special Louisiana Infantry Battalion and two guns of the Lynchburg Artillery. As Union shells crashed in and around his command, Evans kept his men out of sight. After a while, with Union artillery eliciting no Confederate response, Tyler ordered skirmishers forward. Evans responded with his own skirmishers and sent word to Beauregard that he was under attack. With no indication that the activity near Stone Bridge was anything but a small unit action, Beauregard continued with his plan to attack McDowell’s left at Centreville. Johnston, however, grew concerned about the growing sound of battle in the direction of the Stone Bridge and decided to send forces closer to the bridge as a precaution. About 0700 he ordered the brigades of Bee and Bartow, south of Blackburn’s Ford, to support Evans, while Jackson's brigade, also south of Blackburn’s Ford, was ordered to a position between Ball’s and Mitchell’s fords where it could support either the brigades of Cocke or Bonham. The Hampton Legion, having just arrived from Richmond, was also ordered by Beauregard to march in the direction of the Stone Bridge. Elsewhere, Stuart's cavalry, with about 300 troopers, guarded possible crossing sites along Bull Run between Mitchell’s and Ball’s fords, and Holmes’ brigade, having arrived from Fredericksburg two days earlier, had been placed in support of Ewell’s brigade at Union Mills. Despite the shift of these troops away from his right, Beauregard proceeded with his attack plan. About 0700 he had sent orders for Ewell, Jones, and Longstreet to cross Bull Run and move together to Centreville. Upon receipt of their orders Jones and Longstreet crossed the creek and waited. However, for reasons unexplained, Ewell failed to receive his copy of the order. By 0800, when Johnston and Beauregard moved near Mitchell’s Ford in preparation for the attack, Ewell was still waiting on the south side of Bull Run. As the sun rose higher in the sky scores of civilians, many traveling from Washington began arriving on the heights at Centreville, all eager to witness the coming battle. Carriages containing congressmen and their families, reporters, and others crowded the roads and fields, eager to get a good view. Six miles to the west the smoke and noise of Tyler’s demonstration at the Stone Bridge maintained a sense of excitement. While Tyler’s division skirmished with Evans and Beauregard’s flank attack stalled, Hunter’s and Heintzelman’s columns struggled along the narrow wooded trail toward the northern fords. By 0800 the firing at the Stone Bridge had been going on for two hours, and Evans was growing uneasy that the action in his front might be a feint for an attack elsewhere. About 0830 Capt. E. Porter Alexander, commanding a Confederate signal station near the junction, was receiving a message from near the Stone Bridge when he noticed a flash of light on the horizon, a few miles north of the bridge. He immediately identified the reflection as coming from a bronze field gun. A closer look also discovered the sun glinting off large numbers of bayonets. Alexander had spotted Hunter’s and Heintzelman’s columns. He immediately sent Evans a message, “Look out for your left. You are flanked.” Evans quickly took the Louisiana battalion and nine hundred men of the 4th South Carolina Infantry and headed in the direction of Sudley Ford. The remaining two hundred men of the South Carolina regiment stayed at the Stone Bridge. While Evans’ infantry moved to block the Union flank march, one gun of the Lynchburg Artillery moved to Buck Hill, north of the Stone house, and the other gun unlimbered just north of the turnpike, across the road from the home of a free African-American, James Robinson. Following a path from the Stone Bridge, Evans deployed his small command on the southern slope of Matthews’ Hill to cover the Manassas-Sudley Road. Alexander also alerted Beauregard and Johnston to the Union flank march. Stationed a half mile south of Mitchell’s Ford, the two commanders were still waiting for word that Beauregard’s offensive had begun. Although Johnston was apprehensive that the Union troops seen north of the Stone Bridge might be Patterson’s force arriving from the valley, he decided to continue with the attack on Centreville. About 0930, hours behind schedule, the head of Hunter’s column reached Sudley Ford. After a short halt to rest and replenish canteens the march resumed, past the Sudley Church, where parishioners preparing for Sunday service stopped to stare at the passing column. McDowell soon joined the column and urged haste. Meanwhile, Heintzelman’s division missed the road to the crossing at Poplar Ford and continued to follow Hunter. The result would be that both divisions would enter the battle one behind the other, rather than two abreast. Leading Hunter’s advance south from Sudley Ford was the brigade of Colonel Burnside. Burnside’s command included the 1st and 2d Rhode Island Infantries, which were accompanied by the governor of Rhode Island, William Sprague. Sprague had come along to see how the Rhode Island units acquitted themselves in battle. Also in Burnside’s brigade were the 2d New Hampshire Infantry and the 71st New York Infantry, the latter regiment dragging two 12-pounder boat howitzers borrowed from the Washington Navy Yard. Burnside’s brigade artillery, Company A, 1st Rhode Island Light Artillery, was commanded by Capt. William Reynolds. About 1030 Burnside’s command approached Matthews’ Hill and came under fire from Evans’ skirmishers on the crest. After a couple of volleys the Confederate skirmishers withdrew to Evans’ main command on the southern slope. Burnside deployed his brigade, and Reynolds’ six, bronze, 14-pounder rifles unlimbered only 200 yards from Evans’ line, the battery’s right resting on the Manassas-Sudley Road. Reynolds’ guns quickly became engaged with the two guns of the Lynchburg Artillery to the south. About 1100 the brigades of Bee and Bartow (Bee in overall command of both brigades) arrived near the Henry house. Although earlier ordered toward the Stone Bridge, Bee had diverted his column toward the sound of the firing on Matthews’ Hill. Bee’s brigade contained the 4th Alabama Infantry and 2d Mississippi Infantry (the 6th North Carolina Infantry had yet to arrive from Piedmont Station). Bartow’s command consisted of the 7th and 8th Georgia Infantries. Although Bartow’s artillery, the Wise Artillery, had not accompanied the brigade, Bee had brought along his Staunton Artillery, commanded by Capt. John Imboden. Imboden unlimbered his four 6-pounder smoothbores in a depression about one hundred yards north of the Henry house and opened long-range fire on the Union artillery on Matthews’ Hill. Evans had seen the arrival of Bee and Bartow on Henry Hill and rode back to ask for support. Bee was at first reluctant, believing that Henry Hill was a better defensive position, and suggested Evans fall back instead. But Evans was adamant and Bee ordered the two brigades forward, where they extended Evans’ right flank. After McDowell arrived on Matthews’ Hill to take command, Porter extended the Union line to Dogan Ridge, west of the Manassas-Sudley Road. Griffin’s six guns and six guns of Battery I, 1st U.S. Artillery (commanded by Capt. James D. Ricketts), of Franklin’s brigade, unlimbered in front of Porter’s line and opened fire. With the fight growing in intensity on Matthews’ Hill, McDowell sent orders for Tyler to end his demonstration at the Stone Bridge and bring his brigades across Bull Run. About 1130 Sherman crossed his brigade, the 13th, 69th, and 79th New York and 2d Wisconsin Infantries, at a small ford several hundred yards north of the Stone Bridge. Tyler accompanied Keyes’ brigade, consisting of the 2d Maine and 1st, 2d, and 3d Connecticut Infantries, and followed Sherman across Bull Run. Schenck’s brigade remained on the east side of the stream in reserve. On Matthews’ Hill Evans’ position was becoming untenable. Even with the assistance of Bee’s and Bartow’s brigades the Union line was extending beyond both Evans’ flanks. Franklin’s and Willcox’s brigades of Heintzelman’s division were also arriving, with Howard’s brigade not far behind. Franklin’s brigade included the 5th and 11th Massachusetts and 1st Minnesota Infantries. Willcox brought along the 11th and 38th New York and 1st and 4th Michigan Infantries. 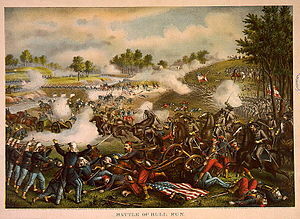 Also Evans received reports of Union forces (Tyler’s two brigades) crossing Bull Run to his rear near the Stone Bridge. Outnumbered and outflanked, Evans reluctantly gave the order to fall back to Henry Hill. The retreat was anything but orderly. Pounded by Union artillery, the three Confederate brigades became disorganized and intermingled as they hurried south across the turnpike. The Confederates rushed past the Robinson house and milled around southeast of the house while officers tried to reorganize the various units. Near the Robinson house the 600-man Hampton Legion arrived and set up a defensive position along the turnpike. It was now shortly before noon and to McDowell’s men on Matthews’ Hill it seemed they had just won a great victory. The Confederates appeared to be in full retreat. One of McDowell’s staff officers rode around the field shouting, “Victory, victory! We have done it!” Some soldiers, just arriving, lamented the fact that the war might be over and they had missed all the excitement. Although McDowell joined in the celebration, he had cause for concern, having learned from prisoners of war that at least a portion of Johnston’s army had arrived from the valley. Meanwhile, Burnside requested and received permission to withdraw his brigade to reorganize and replenish ammunition. The brigade withdrew a short distance where it would remain in reserve for the rest of the day. Near Blackburn’s Ford Johnston had decided to ride toward the sound of fighting to the west. Any thought of a flank attack against Centreville was forgotten and the commands of Longstreet and Jones were withdrawn to their former positions south of Bull Run. Beauregard, his planned attack in shambles, followed Johnston. About noon Jackson’s 2,600-man brigade arrived on Henry Hill. Jackson had earlier been ordered to a position near Ball’s and Mitchell’s fords but, like Bee and Bartow, marched instead to the sound of firing on Matthews’ Hill. Arriving southeast of the Henry house, Jackson was met by an excited General Bee, shouting that the Federals were driving them back. Jackson responded calmly that his command would give them the bayonet, and then moved his regiments into position on the southeast slope of a ridgeline about 400 yards from the Henry house. On Jackson’s right, toward the Robinson house, Jackson placed the 5th Virginia Infantry. On that regiment’s left the 4th Virginia Infantry moved into position, behind which was placed the 27th Virginia Infantry. The 2d Virginia Infantry extended Jackson’s line southward, and the 33d Virginia Infantry held Jackson’s left flank near the Manassas-Sudley Road. After Jackson’s arrival Imboden’s battery, nearly out of ammunition, began withdrawing from the vicinity of the Henry house. Jackson, however, halted the unit and ordered it into position along the ridge in front of Jackson’s line. Even out of ammunition the battery could at least give the appearance of a threat. Shortly after Imboden relocated his battery, Beauregard and Johnston arrived, bringing additional guns from various batteries they had encountered along the way. As Jackson gestured for Imboden to go to the rear, Jackson was struck in the hand by a stray bullet. Jackson wrapped a handkerchief around his hand and assured Imboden the wound “was only a scratch—a mere scratch.” Before withdrawing, Imboden received permission to fire his last three rounds. The young officer stood too close to the gun and suffered an injury that would cause permanent deafness in one ear. After Imboden’s withdrawal, the guns brought by Johnston and Beauregard, thirteen in all, were placed on the ridge in front of Jackson’s line. Near the Robinson house Johnston and Beauregard attempted to assist in rallying the remnants of Evans’, Bee’s, and Bartow’s commands. Discovering that all the officers of the 4th Alabama Infantry had been wounded, Johnston grabbed the unit’s colors and offered to lead the regiment personally, but Beauregard intervened and placed one of Bee’s aides in command of the Alabamians. On Matthews’ Hill and Dogan Ridge the brigades of Burnside and Porter of Hunter’s division; Franklin’s, Willcox’s, and Howard’s brigades of Heintzelman’s division; and Sherman’s brigade of Tyler’s division waited. McDowell made no immediate attempt to commit them to battle. Neither did McDowell give any orders to Keyes’ brigade, which had separated from Sherman and marched to Young’s Branch, just north of the Robinson house. On Henry Hill the Confederates worked to establish a strong defense for an expected Union assault. Although Evans’, Bee’s, and Bartow’s commands were yet to be fully reorganized, Jackson’s brigade and the artillery brought forward by Johnston and Beauregard held the Confederate left flank and center, while the Hampton Legion on Jackson’s right, held the high ground around the Robinson house. With the situation on Henry Hill stabilized, Beauregard suggested that Johnston, although senior in command, return to his headquarters at the Lewis house and forward reinforcements to the battlefield. As Johnston later reported, he assigned Beauregard command of the army’s “left wing,” while Johnston retained overall army command. Johnston then rode back to his headquarters to hasten more troops to Henry Hill. While the Confederates brought up reinforcements to Henry Hill and McDowell rested his troops on Matthews’ Hill, Tyler was about to get the battle restarted. After crossing Bull Run Tyler had led Keyes’ brigade to a position along Young’s Branch, north of the Robinson house. Without any consultation with McDowell, Tyler ordered Keyes to attack the Henry Hill. About 1300 Keyes left the 1st and 2d Connecticut Infantries in reserve and sent the 2d Maine and 3d Connecticut Infantries across the turnpike and into the yard of the Robinson house. The Hampton Legion fell back and Keyes’ regiments soon confronted Jackson’s 5th Virginia Infantry. The 2d Maine Infantry and 5th Virginia Infantry were both uniformed in gray, and they hesitated to open fire on one another. But the Virginians took only a brief moment to determine the identity of the Maine regiment and opened the fight with a volley. For almost twenty minutes the two sides exchanged shots, with the Virginians, joined by the Hampton Legion, firing from the wood line, while the Maine and Connecticut regiments remained in the open ground around the Robinson house. Instead of committing the rest of his brigade as support, Keyes ordered the 2d Maine and 3d Connecticut Infantries to withdraw. The entire brigade then shifted east toward the Stone Bridge where it remained out of the fight for the rest of the day. Keyes’ withdrawal was followed by another, short lull in the battle. About 1400, almost two hours after the Union victory on Matthews’ Hill, McDowell finally issued orders for a forward movement. But it was not for a general advance. Instead, he ordered Maj. William F. Barry, the Union army’s chief of artillery, to send the batteries of Griffin and Ricketts from Dogan Ridge to Henry Hill. Both Griffin and Ricketts protested the move. Placement of the guns on Henry Hill would bring the artillery perilously close to the Confederate line. The battery commanders asked that they be sent to the high ground west of Henry Hill (Chinn Ridge). The order stood, however, and the two batteries, with Griffin leaving a disabled gun behind, limbered up and headed for Henry Hill. The guns rumbled across the turnpike and up the Manassas-Sudley Road, with Ricketts unlimbering his left gun a hundred yards south of the Henry house. When Confederate sharpshooters in the house opened fire on Ricketts’ men and horses, Ricketts ordered his guns to fire into the house, mortally wounding the 85-year-old, bed-ridden widow Judith Henry. Griffin’s five guns soon unlimbered just north of the Henry house, and his and Ricketts’ batteries began a close-range artillery duel with the Confederate artillery along Jackson’s line, only three hundred yards away. One of the Union shells exploded near Beauregard, killing his horse and knocking the heel from one of his boots. Shortly after the two Union batteries were in position, infantry from Heintzelman’s division, ordered up by Major Barry, began to arrive on Henry Hill. To support Ricketts’ battery, Willcox’s 11th New York Infantry moved into position behind and slightly to the south of the guns. Franklin’s 1st Minnesota Infantry moved farther south and fell in on the New Yorkers’ right. The two infantry regiments suddenly found themselves confronting the 33d Virginia Infantry on the left of Jackson’s line. Unsure of one another’s identity, the units eyed each other briefly. The confusion resulted from the fact that the New York regiment was dressed in gray and the Virginians were still wearing civilian clothes. Both sides soon opened fire, and the New Yorkers and Minnesotans fell back to the Manassas-Sudley Road. Earlier, Jackson had placed Colonel Stuart, along with about a hundred and fifty cavalrymen, on the Manassas-Sudley Road southwest of the 33d Virginia Infantry. Stuart saw some of the gray-clad New Yorkers falling back and mistook the two Union regiments for retreating Confederates. He quickly rode forward, shouting, “Don’t run, boys; we are here.” The Northerners ignored the Confederate officer’s pleas, and, after seeing a color bearer passing with the United States flag, Stuart realized his mistake. He quickly ordered his men to charge, and the Union troops were driven into the woods west of the road. As Stuart’s men withdrew, additional Union troops began to arrive on Henry Hill. The 14th Brooklyn of Porter’s brigade arrived behind Ricketts’ battery, and the 33d Virginia Infantry fell back to its former position in the wood line southeast of the Henry house. The Marine battalion of Porter’s brigade had arrived behind Griffin’s battery, but hearing the firing to the south of Ricketts’ battery the marines had fallen back to the turnpike. They were replaced by the 38th New York Infantry of Willcox’s brigade, which lay down below the crest of Henry Hill to escape the Confederate artillery fire. It was now about 1430 and while three of his guns dueled with Confederate artillery in front of Jackson’s line, Griffin took his two remaining guns and moved about two hundred yards south of Ricketts’ position. That movement placed the two guns near the 33d Virginia Infantry. As the guns unlimbered and prepared to open fire, the Virginians calmly marched out of the woods and halted in front of the section. Griffin immediately gave the order to fire but Major Barry, who had accompanied the guns, shouted that the troops were actually part of Griffin’s infantry support. Griffin argued they were the enemy, and, while the two discussed the matter, the Virginians fired a volley that tore through the section. Griffin, Barry, and other survivors escaped back to the Manassas-Sudley Road, and the Virginians rushed forward and captured both guns. Griffin later said, “That was the last of us.” North of the Henry house gunners manning Griffin’s remaining three guns saw the capture of the section and withdrew their guns back to the turnpike. The 38th New York Infantry, although without a battery to support, remained lying behind the crest of the hill. The Confederate capture of the two guns was short-lived, however. The 14th Brooklyn rushed up the slope and drove the 33d Virginia Infantry back to the wood line and recaptured the two guns. After recapturing Griffin’s section, the 14th Brooklyn continued to fire into the left flank of Jackson’s line, driving the 33d Virginia Infantry back through the 2d Virginia Infantry. Meanwhile, Colonel Cocke had been ordered to forward troops to the left and the first of them began to arrive on Henry Hill. Cocke’s 49th Virginia Infantry arrived on Jackson’s left, while two of his other regiments, the 8th and 18th Virginia Infantries, were not far behind. Two companies of the 2d Mississippi Infantry of Bee’s brigade also arrived on the hill. Under pressure from the 14th Brooklyn, a large portion of the 2d Virginia Infantry joined the retreat of the 33d Virginia Infantry, and Jackson saw the left of his line collapsing. While he sent his artillery to the rear, Jackson ordered the 4th and 27th Virginia Infantries forward. They were joined by the 49th Virginia Infantry, two companies of the 2d Mississippi Infantry, and the 6th North Carolina Infantry of Bee’s brigade, which had just arrived from Piedmont Station. In hand-to-hand combat the New Yorkers were driven back to the Manassas-Sudley Road and Ricketts’ battery and Griffin’s two guns captured. Ricketts himself was wounded in the thigh. For the next hour the Union guns would become the focal point of the fight on Henry Hill, as both sides fought to capture them. While the Confederates halted among Ricketts’ battery, the newly arrived 1st Michigan Infantry of Willcox’s brigade attempted to recapture the guns but was driven back. The 5th and 11th Massachusetts Infantries of Franklin’s brigade arrived next and made an attempt to reclaim the guns. Although the 5th Massachusetts Infantry broke and fled back toward the Manassas-Sudley Road, the 11th, wearing gray uniforms, drove the disorganized Confederates back and captured the guns. The 4th and 27th Virginia Infantries then fell back to their original positions. Beauregard’s attack drove the 11th Massachusetts Infantry back to the Manassas-Sudley Road and Ricketts’ guns changed hands once again. While the Hampton Legion lay down around the Henry house and the 5th Virginia Infantry halted among Ricketts’ guns, Beauregard paused to offer assistance to the wounded Ricketts. Rather than launch large-scale, coordinated assaults against the Confederates on Henry Hill, McDowell had spent the morning and early afternoon allowing his army to be committed piecemeal, frittering away his numerical advantage. This allowed the Confederates to defend with lesser numbers while bringing reinforcements to the field. McDowell issued orders for forward movement, but again it would be gradual and uncoordinated. First, Howard’s 2,000-man brigade on Dogan Ridge was ordered to Chinn Ridge, south of the turnpike and several hundred yards west of Henry Hill. Sherman’s 3,000 men, also on Dogan Ridge, were sent to assault Henry Hill itself. Porter’s Regular infantry battalion was sent from Dogan Ridge to support Sherman. About 1500, while Howard headed for Chinn Ridge, Sherman crossed the turnpike and halted on the Manassas-Sudley Road. The Regular infantry battalion halted along Chinn Branch, west of the Henry house and Manassas-Sudley Road. Sherman began his attack but, like earlier Union assaults, he would not commit his entire command at once. Instead, he sent the 13th New York Infantry up the slope of Henry Hill. The regiment soon engaged the Hampton Legion around the Henry house, where it halted, lay down, and continued a short-range gun battle. Sherman next ordered the 2d Wisconsin Infantry up the Manassas-Sudley Road. When abreast of the Henry house, the regiment left the road and advanced toward the house. Clad in gray uniforms, the Wisconsin troops took fire from Confederates on Henry Hill as well as from Union troops west of the Manassas-Sudley Road and were forced to fall back to the relative safety of the road. Sherman’s 79th New York Infantry then moved forward. Commanded by Col. James Cameron, brother of Secretary of War Simon Cameron, the regiment charged to within yards of the Henry house. But Colonel Cameron was mortally wounded and the New Yorkers, like the Wisconsin troops before them, fell back to the Manassas-Sudley Road. As Sherman committed his last regiment, the 69th New York Infantry, two guns of Reynolds’ battery of Burnside’s brigade arrived and unlimbered in a clearing west of the Manassas-Sudley Road and opposite the Henry house. Under cover of Reynolds’ two guns, the 69th New York Infantry, joined by the 38th New York Infantry on its right, left the Manassas- Sudley Road and charged up the slope toward the Henry house. After a brief struggle in which Hampton was severely wounded, the 4th Alabama Infantry, 7th Georgia Infantry, and other Confederates were driven back to the woods south of the Henry house, and the two New York regiments captured Ricketts’ and Griffin’s guns. The New Yorker’s celebration was short-lived. The 18th Virginia Infantry of Cocke’s brigade had arrived from Ball’s Ford and, along with remnants of various Confederate units, drove the New Yorkers back to the Manassas-Sudley Road and recaptured the Union guns. Cocke’s 8th Virginia Infantry also reached the Henry house from Ball’s Ford and set up a defensive position just west of the house. The Union guns and Henry Hill had changed hands for the last time. Sherman’s battered brigade, along with portions of other Union brigades in the woods west of the Manassas-Sudley Road, began withdrawing back to the Warrenton Turnpike. While the troops milled around the intersection near the Stone house and McDowell tried to rally them, some Hampton Legion soldiers turned one of Ricketts’ guns around and fired a few shots toward the Stone house. It was about 1600, and, with the Union threat against Henry Hill apparently over, the Confederates turned their attention to Chinn Ridge where Howard’s brigade had arrived. Leaving his 3d and 5th Maine Infantries in reserve near the Warrenton Turnpike, Howard had led the 2d Vermont and 4th Maine Infantries to the crest of Chinn Ridge and opened fire on Henry Hill. Howard’s arrival on the Confederate left flank, however, coincided with the arrival of fresh Confederate troops. About 1600 the 2d and 8th South Carolina Infantries of Bonham’s brigade reached Henry Hill from Mitchell’s Ford. 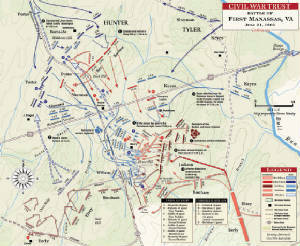 The two regiments entered the Manassas-Sudley Road south of the Henry house and opened long-range fire on Howard’s men. Also appearing on the field was Colonel Elzey’s brigade, the last of Johnston’s troops to arrive from the valley that day. Accompanying Elzey was General Smith, whose brigade would not show up until the following day and who, by virtue of rank, briefly assumed command of Elzey’s brigade. Smith led the brigade to the Manassas-Sudley Road, where he was wounded, and Elzey resumed command. Along with Stuart’s 150 cavalrymen, Elzey crossed the Manassas-Sudley Road southwest of the Henry house and moved toward Chinn Ridge. Close behind Elzey was Colonel Early’s brigade, which had recently arrived from McLean’s Ford and now fell in on the left and perpendicular to Elzey’s line. Stuart’s cavalry covered Early’s left. At a distance of about 200 yards Elzey and Early opened fire on Howard’s thin line. While the 2d Vermont and 4th Maine Infantries returned volley for volley, Howard rode back to the turnpike to bring forward his other regiments. With difficulty he managed to bring most of the men to the crest of the ridge, and they took their places on the firing line. However, under pressure from Elzey and Early, Howard’s command soon broke and fled back toward the turnpike. It was now about 1700, and everywhere McDowell’s army was disintegrating. Thousands, in large and small groups or as individuals, began to leave the battlefield and head for Centreville. McDowell rode around the field trying to rally regiments and groups of soldiers, but most had had enough. Unable to stop the mass exodus, McDowell gave orders for Porter’s Regular infantry battalion, near the intersection of the turnpike and Manassas-Sudley Road, to act as a rear guard as his army withdrew. The unit briefly held the crossroads, then retreated eastward with the rest of the army. A few Confederate units attempted to pursue the retreating Union troops, but the victorious Confederates were almost as disorganized as their defeated counterparts. Some infantry regiments and cavalry harassed Union stragglers, while artillery firing from vantage points further prodded the Federal troops along. The Union retreat on the turnpike quickly turned into a route when an overturned wagon blocked the Cub Run Bridge. Panic-stricken soldiers threw away their weapons, waded the stream to safety, and joined hundreds of civilian spectators attempting to escape eastward. Wagons and artillery were abandoned, including the 30-pounder Parrott rifle, which had opened the battle with such fanfare. Unable to reorganize his command at Centreville, McDowell gave the order to fall back to Fairfax and later to the capital. Shortly after the close of the battle, President Jefferson Davis arrived by train from Richmond and reached the battlefield about 1800. Later, Davis met with Johnston and Beauregard at Beauregard’s headquarters. Sources: United States Army Center of Military History; Beauregard, Pierre G. T. “The First Battle of Bull Run.” In Battles and Leaders of the Civil War, edited by Clarence C. Buel and Robert U. Johnson. New York: Century Co., 1884, 1887, 1888. Vol. 1, pp. 196–227; Fry, James B. “McDowell’s Advance to Bull Run.” In Battles and Leaders of the Civil War, edited by Clarence C. Buel and Robert U. Johnson. New York: Century Co., 1884, 1887, 1888. Vol. 1, pp. 167–93; Hennessy, John. The First Battle of Manassas: An End to Innocence, July 18–21, 1861. Lynchburg, Va.: H. E. Howard, 1989; Johnston, Joseph E. “Responsibilities of the First Bull Run.” In Battles and Leaders of the Civil War, edited by Clarence C. Buel and Robert U. Johnson. New York: Century Co., 1884, 1887, 1888. Vol. 1, pp. 240–59; U.S. War Department. The War of the Rebellion: A Compilation of the Official Records of the Union and Confederate Armies. Washington, D.C.: Government Printing Office, 1893. Vol. 2, ser. 1, contains documents and reports concerning First Bull Run.